Having a secret cannabis life that you are afraid to discuss with others can be a hindrance and unhealthy. It can hinder you from building meaningful relationships with people because you are afraid to be judged if they knew you consumed cannabis. It can cause you to pre judge others for thinking they would even judge you in the first place. It can hinder you from getting out because in your mind you feel that you can only be your true self in your home so you would rather stay there. It can cause you to lie to people you love and keep secrets from them. For the last 4 years I have lived in a neighborhood filled with teachers, nurses, law enforcement, people who work in oil and gas, and a lot of people who work in corporate America. I was always afraid to get to know my neighbors on a personal level because it would become more people that I had to hide my cannabis use from. With SQ788 coming along and the creation of Tokie Tees, my mindset changed though and so did others. I knew for SQ788 to pass and for the stigma surrounding cannabis to end, some of us who were afraid to come out of the secret garden, had to take that scary first step out. We had to inform and educate people that just because you use cannabis, it doesn’t mean you are a bad person. We couldn’t let the stereotypical “stoner” who never cared that people knew about their cannabis use be the face of this new movement. We had to show people that we are active contributors to our society. That we are members of your local church. That we are members of your local PTA. We build your houses. We cook your dinners at restaurants. We treat your kids at the hospital. We run next to you in the local 5k Fun Run. We volunteer at homeless shelters. We are everywhere. The 57% spoke up in a voting booth and got medical legalization passed here in Oklahoma but I saw that people were still afraid to step out of the dark. I wanted to help change that. This last 4/20 weekend, one of my best friends and now business partner, Brent and I went to Cannabis Cup SoCal and I purchased one of the coolest cannabis T-shirts I’d seen. Well leading up to SQ788 I wore that thing everywhere to let people know I was pro cannabis. 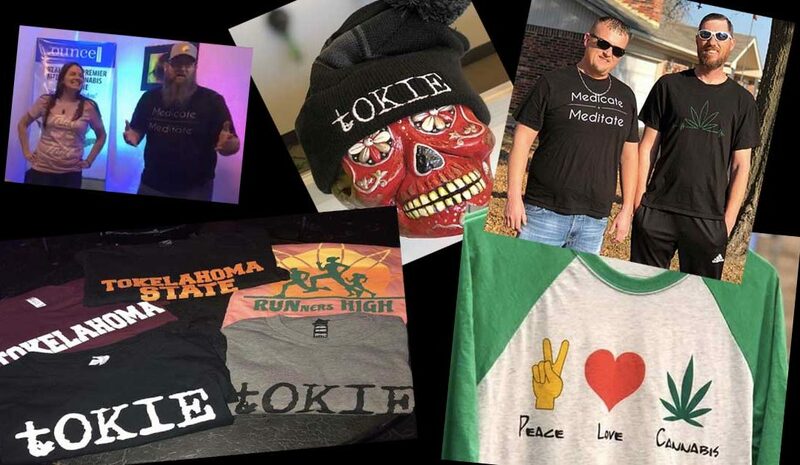 I wore it to the store, to pick up pizza, to the gym, and also I wore it to the first annual Mid America Medical Cannabis Convention they had at the OKC fair grounds this last May. People kept coming up to me and complimenting me on it and asking where I got it and asking if they could buy it online. It started so many conversations which got the wheels in my head turning. Then, I noticed at that event and the next local cannabis event I went to, that there were absolutely no quality cannabis tees being sold. That’s when I knew that there was a need for local cannabis-themed shirts and I wanted to help fill that need. An Okie is described as someone who is a native or inhabitant of Oklahoma. Being an Okie is something I’ve ALWAYS been proud to announce. Being an Okie who likes to “toke” cannabis though? Not so much. When my mindset changed, I then wanted everyone who I came in contact with to know that I’m not just an Okie, but I’m a “Toking” Okie! And I wanted to do that with a shirt. That’s when I pitched the idea to my friend Brent. We wanted other cannabis users to know they aren’t alone. We didn’t want our shirts screaming “I AM A POTHEAD” though. We wanted to create a T-shirt that we, and others could wear that didn’t throw cannabis in your face, but had designs that gently whispered off the skin soft material “Hey, I’m pro-cannabis”. So we created our first few designs and Tokie Tees was born. Before our first designs were printed, I posted on my neighborhood Facebook page about these new T-shirt’s and asked if anyone wanted to buy one. I did it of course to get some early sales, but I also did it to see how people responded to weed shirts being sold in their HOA neighborhood. People responded with open arms to me and open wallets to our T-shirt’s. I’ve had neighbors who don’t or can’t consume cannabis telling me how they support it and also wanted to support our business by buying a shirt for themselves or a family member. I’ve had neighbors tell me how they were scared to even ask how to get a medical card because they didn’t want anyone to know they were pro-cannabis, but once they saw my shirt post they knew they could ask me. I’ve had neighbors tell me they voted no on SQ788 but now since talking to me they are no longer against cannabis. I’ve been in so many conversations about cannabis and have built so many meaningful relationships in the last few months and it’s all because of a T-shirt. Daniel has such an entrepreneurial spirit. He works tirelessly to ensure his products are marketed in meaningful ways. Everyone sees that! What you may not see if the caliber of person Daniel is. Daniel’s personality is so real, and anyone that comes into contact realizes it quickly. I’m fortunate to call Daniel and Neighobor and friend.